· Wash-out issue almost not exists in Beta65 Pro 2 drones. 2pcs 300mAh HV 1S high rate batteries are recommend by default. · Lighter, faster and higher integrated than the X series drones. 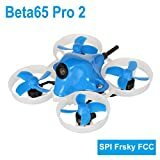 With the high performance STM32F411 processor FC boards and tuned betaflight_matekf411rx_4.0.0 (Development Version), pilots fly it like a faster Tiny Whoop racing drone. · Whole drone no soldering or tinkering necessary. Customized lightest 0802 12000KV motors with cable connectors. Just plug and play.